"Books are delightful society. If you go into a room and find it full of books - even without taking them from the shelves they seem to speak to you, to bid you welcome." Since the Café Fashionista Book Club debuted in January, we have conquered romance via Jennifer E. Smith’s The Statistical Probability of Love at First Sight; paranormalcy via Meg Cabot’s Abandon; and dance via Sophie Flack’s Bunheads. Today we begin tackling something slightly different…The Selection by Kiera Cass. 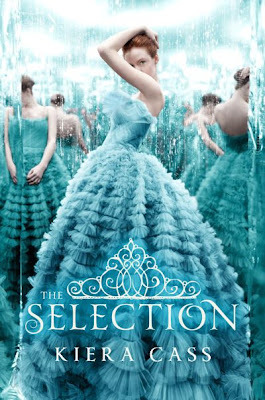 The Selection the first title in a Trilogy that blends the worlds of dystopia (a la Suzanne Collins’ The Hunger Games) and reality television (specifically, The Bachelor / The Bachelorette). ♥Book Synopsis: For thirty-five girls, the Selection is the chance of a lifetime. The opportunity to escape the life laid out for them since birth. To be swept up in a world of glittering gowns and priceless jewels. To live in a palace and compete for the heart of gorgeous Prince Maxon. Thanks to We ♥ It and Goodreads for the pictures. Wow, this looks so intriguing. Is this Young Adult? This look really interesting. I'm thinking of an alternative history book at the moment. I love the cover. Cool title too. Awesome selecting THE SELECTION. It looks really worthy of a good read. I'm really going to have to look in to this book. I do look forward to see what the "book club" selection is, for the month. I love Miss Pandora one the first photo! :) Btw love your selection...definitely love! Eeek! That is such an interesting premise! well this sounds interesting. i may have to add this to my list. Wow wow wow! I am so glad to have read this post!! My summer has just started, and I am very much looking forward to getting some good reading done. This book looks fantastic! Ooh... I've been thinking of starting a book club on my blog- and yours gives me grand inspiration! I'll be joining! ;). This book is on order at my library and I just put the request in. :D Can't wait to get started! Sounds like an intriguing read. Another excellent selection by you! Lovely photographs. The top one makes me want to drop everything and head out somewhere to read, alone. That actually sounds amazing! The plot actually reminds me of a book I read in like 6th grade and loved! The synopsis has me hooked! Is it terribly shallow of me to want to read it because of that gorgeous blue gown? But your description makes it sound great too! I just found out the WB is going to do Kiera Cass's book. Amiee Teegan will be America and Narnia's William Mosley will be Aspen & Ethan Peck as Prince Maxon! Its a TV movie at the moment. This sounds good! If it's not out in the UK though I don't have high hopes for New Zealand. Will keep my eyes peeled! However, I did just finish a fabulous memoir by a celebrity Hollywood hairstylist. Surprising since I didn't think it wood appeal to me. you are so adorable Erika. I love the importance you place on intellectual pursuits. Love.